For Halsway’s second Exploring Folklore weekend, the focus is that extraordinary wealth of folklore that was, and still is, found on Dartmoor. All our guest contributors come from the area and, between them, demonstrate not only how we live within our own folklore, but how closely all the different aspects of folklore combine to define a culture by drawing on the past, living in the here and now, and shaping the future. 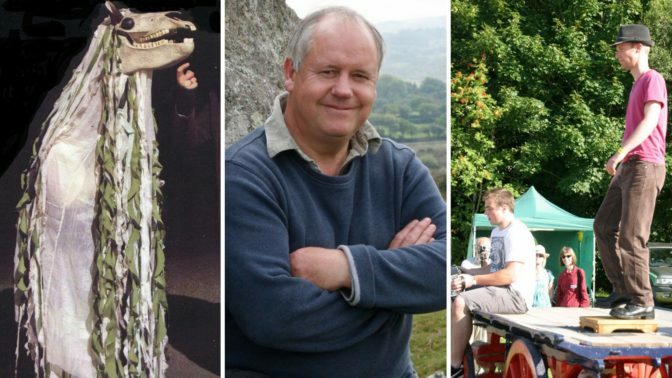 The team includes Dartmoor tradition bearer Bill Murray, Dartmoor step dance champion (and singer, musician & composer) Matt Norman, plus Tom Pearce’s Old Grey Mare will be travelling up from Dartymoor! Doc Rowe returns along with weekend host Tom Brown, for an enjoyable weekend of talks, presentations, practical workshops and performances exploring folklore, folklorismus and fakelore. This weekend is planned as an enjoyable and instructive event for anybody who wants to explore or learn more in the field of folklore – as student, participant or exponent. Bill Murray is a tradition-bearer and lore-gatherer; a sponge that has collected and adsorbed the tales, the wisdom, the legends and the whole culture of the area where he was born and bred. A singer, a musician, a storyteller and so much more of the moor. Bill will be sharing his knowledge and masterminding A Dartmoor Evening. Matt Norman is a performer, composer, conductor, and exceedingly fine step-dancer (among other talents!). He is steeped in the traditions of Devon and Dartmoor, and will be contributing to our Dartmoor Evening as well as taking a have-a-go workshop on Dartmoor stepping. Tom Pearce’s Old Grey Mare has been found! And the gang – with Uncle Tom Cobley and all – will be travelling up from Dartymoor to explain how a new tradition can arise from a series of pre-existing elements. They’ll also be performing the event itself. Doc Rowe returns to Exploring Folklore to complete the (time limited) second half of his Blood, Booze and Bedlam anthology of customs. Doc, a South Devon boy, has become arguably the most important English collector since Kidson or Sharp, documenting folklore, song, dance and cultural traditions for the last thirty years. Tom & Barbara Brown have spent a lifetime immersed in and devoted to folk song, music and tradition. Residing in North Devon, the duo are well-known performers with an enormous song repertoire, and a specialism in songs of the West Country.